This device allows you to replace your obsolete factory MAF sensor with a newer style LT1 3" MAF, LS1 3.5" MAF, and some others. It is plug and play for the Buicks. 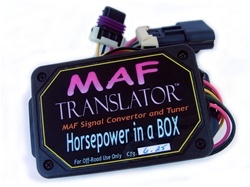 You will need to purchase a MAF sensor separately (not for use with a stock MAF). It will work with any chip. If you already have a TT chip, it does not need to be changed to use this.